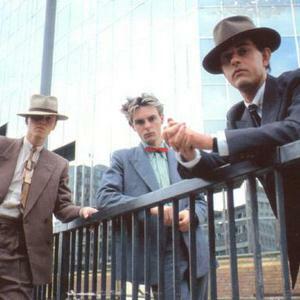 Heaven 17 is a British synthpop band originating in Sheffield, South Yorkshire, England, formed in 1980. Taking their name from a fictional pop group mentioned in Anthony Burgess's novel A Clockwork Orange (where 'The Heaven Seventeen' are at number 4 in the charts with 'Inside'), Heaven 17 formed when Ian Craig Marsh and Martyn Ware split from their earlier group The Human League and formed production company British Electric Foundation (B.E.F.). Shortly after, they recruited their good friend and photographer Glenn Gregory on vocals to complete their lineup for Heaven 17. Taking their name from a fictional pop group mentioned in Anthony Burgess's novel A Clockwork Orange (where 'The Heaven Seventeen' are at number 4 in the charts with 'Inside'), Heaven 17 formed when Ian Craig Marsh and Martyn Ware split from their earlier group The Human League and formed production company British Electric Foundation (B.E.F.). Shortly after, they recruited their good friend and photographer Glenn Gregory on vocals to complete their lineup for Heaven 17. Contrary to popular belief, they were not New Romantics and shared few visual characteristics with groups such as Spandau Ballet and Culture Club. Like The Human League, Heaven 17 heavily used synthesizers and drum machines. They had a few minor hits including the early 'Play To Win' which featured on the album Penthouse and Pavement. Their debut single '(We Don't Need This) Fascist Groove Thang' from the same album attracted some attention, became a left-wing anthem for a while, and was banned by the BBC because of its overtly political lyrics, but it still reached number 45 in the UK singles chart. Major chart success eluded them until the single 'Temptation' (in which they were augmented by the vocalist Carol Kenyon) reached number 2 in the UK charts in summer 1983. Other songs from the same album, The Luxury Gap, also charted though not as high - 'Come Live With Me' reached number 5 in the UK, 'Crushed By The Wheels Of Industry' reached number 17, and 'Let Me Go', reaching 41 in November 1982. The album itself charted at their best ever position, number four. At the end of 1983, the band helped re-launch Tina Turner's solo career, producing and providing backing vocals on her debut hit 'Let's Stay Together'. 1984 featured the release of the moderately successful How Men Are, which reached number 12. The band also worked on the Band Aid single at the end of 1984, with Gregory supplying vocals alongside Midge Ure and Sting. However, they did not perform at Live Aid the following year. Pleasure One (featuring the single 'Trouble') appeared in 1986 and it was followed up in 1988 with Teddy Bear, Duke & Psycho (featuring the single 'Train Of Love In Motion'). The early 90's were a quiet period for the band and they wouldn't work together as Heaven 17 until 1996's Bigger Than America. In the preceding years, Marsh and Ware produced a second B.E.F. album to 1981's original Music of Quality and Distinction and Gregory formed the band Ugly. Ware became an in-demand producer, working for the likes of Terence Trent D'Arby, Alison Moyet and Erasure. 2005 saw the release of the long-awaited Before After; the album having a much more contemporary dance sound compared to previous albums.